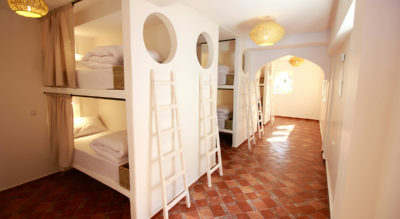 Our Surf Houses are located in Anza and Tamraght. Its welcoming inhabitants and growing surf culture make it the perfect place to spend an unforgettable holiday. It has some of the most consistent surfing conditions in the region, ranging from waves for those just starting out to large waves for experienced surfers. Our Surf Houses are just in front of the waves, so all you have to do is put on the neoprene, grab the board and away you go! Our Houses are the typical Moroccan one but with all the facilities that a surfer can dream with and the most important, just in front of the waves! 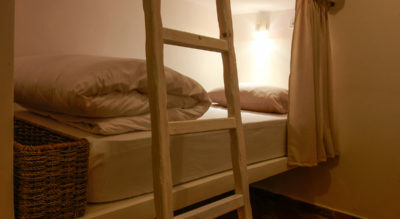 We have different kind of accommodations: shared rooms and private rooms. The common areas are the kitchen, the living room and the amazing terrace, all of these area with incredible sea view. We, The Blue Waves Team, are a super passionate surfers and we are always sharing our passion with all our guests. We are always at your disposal and we´ll show you the best places in the area for surfing, nature and moroccan culture. We have our own Surf School offering lessons, guiding and rentals. We offer many excursions (Paradise Valley, Imsouna, Agadir Souk,…) and extra activities (Camel route, massages, ….). You´ll never feel bored with us, the time will pass quickly because you´ll enjoy each second. Blue Waves offers a comprehensive set of packages adapted to your needs with the sole aim of offering the perfect surfing holidays in Morocco. We believe we are part of the experience and therefore we want it to be memorable. You will find a different concept here. A second home, carefully thought, for those who are searching for more. You will find a combination of great staff, quality service, local knowledge, remarkable accommodation and the relaxed Moroccan surf vibe. 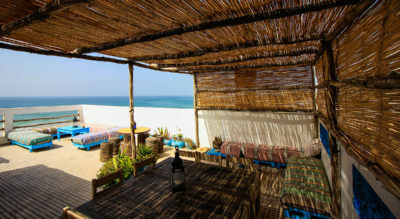 We are known for being the most authentic, we continue keeping the real Surf House spirit and sharing with you the unique Moroccan experience.